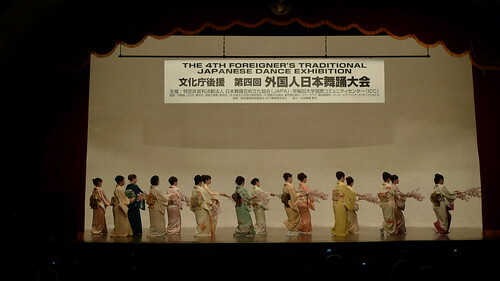 The 4th Annual Foreigner's Traditional Japanese Dance Exhibition (第四回外国人日本舞踊大会) was held in my university earlier this evening. I didn't know a thing about it until the night before when Niklas showed me a website. I was curious, so I decided to tag along, immerse myself more into Japanese traditions! I will remain an ignorant foreigner no more! 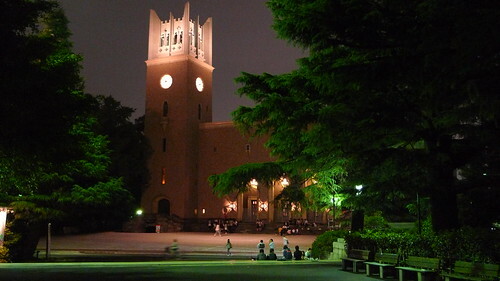 The event was held in the famed Okuma Memorial Hall, which, to me, is by far the most recognizable building of Waseda University. I guess that's the point of the building. 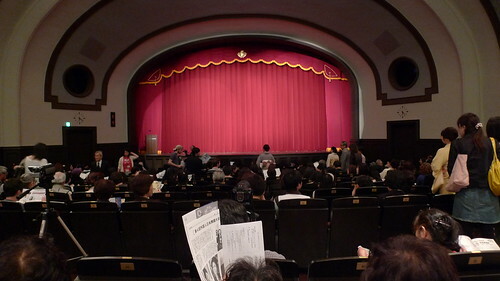 It was the first time I've ever entered the hall! I needed to take a photo of myself to commemorate this historic event, not the exhibition, but me, entering Okuma Memorial Hall for the very first time. Niklas was next to me. The photo was pretty blurry, but I still look pretty, so I decided to keep it. Ah, such vanity. 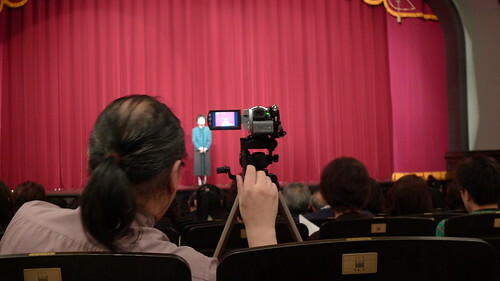 I didn't get the best seats since the dude in front of me with the camcorder was quite an annoyance (for me to get a good picture or video of the performance). I realized that foreigners can still look indescribably fetching in kimonos. Ah, the glorious beauty of kimonos, I rank it up there with qipaos as the best traditional outfits ever! Of course, I enjoyed the performance. The group followed it with the 'ehigasa' 絵日傘(parasol dance). Then another team came in to do the 'tenaraiko' 手習子 dance. I was feeling pumped! Then another team came in to do the 'sakura sakura dance', followed it with the 'ehigasa' dance. And then another team came in and did the 'tenaraiko' dance. This went on and on. Until I realized that this was the point of the exhibition. Different teams were supposed to give different interpretations of these 3 famous dances. And because I am an ignorant foreigner incapable of spotting the subtle differences of each performance, I thought I was stuck in a time loop. Which was bemusing and amusing at the same time. But then, there were some vocal performances of traditional Japanese songs, performed by a woman, and then a man, with piano music in the background. I only have video of the lady's performance. 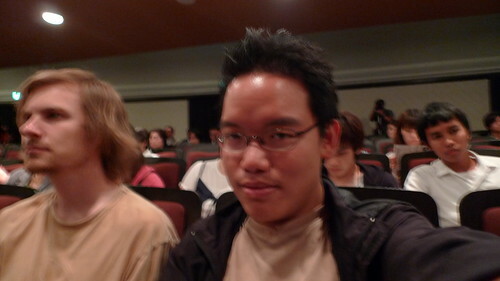 Her name is Hiroko Sato, from Tokyo University of Arts. And no, the reason I have only a video of her performance and not the guy's has nothing to do with her being cute, I'm not that shallow, I was just too tired to film the guy as well! So this is Hiroko Sato singing 'kono dou' (translated as 'this path' or something like that). Oh, and here's one of the rare photos I took of the performance. As much as I loved my new camera, the Panasonic DMC-LX3, the 2.5 zoom is quite a limitation. Hope they'll come up with a lens to rectify this problem. That was the furthest I could zoom in. This is the ending of the performance, almost all team members went on stage to do that last dance, with the audiences joining in for the fun. As I was filming, I noticed that the lady in red sitting few rows behind me (who appeared at the 17-second mark) is quite pretty too. But that's irrelevant. This video is just an attempt for me to share that experience with you.